as i was saying last week, we never got much of even a southern california winter this year, so springtime greens are in the markets early. i’ve read about stinging nettles over the years, but never foraged for them or bought any. turns out, it’s not something you do on a whim, since stinging nettles have earned their name from tiny barbs that break easily and dispense histamines and irritants to the skin, it’s best to have gloves, shears and a bowl or bag to collect them with. so why bother, if they’re so potentially annoying? the irritants are disarmed after a quick blanching, leaving behind a spinach-like green full of vitamin a, c, iron, potassium and calcium, without the oxalic acid in spinach that prevents absorption of many of the nutrients. after you trim the leaves from thicker stems [again, with gloves on] get a pot of salted water to a rolling boil, throw in your cut leaves for a minute or 2, and then dunk in a bowl of cold water. let them drain completely in a colander and you’re ready to either pack them up to freeze or use as a cooked green. i saw some suggestions to purée and make pasta or gnocchi, so i thought i’d try something similar. i also used the opportunity to try out half-white / half-rye egg pasta, and i like how it came out. 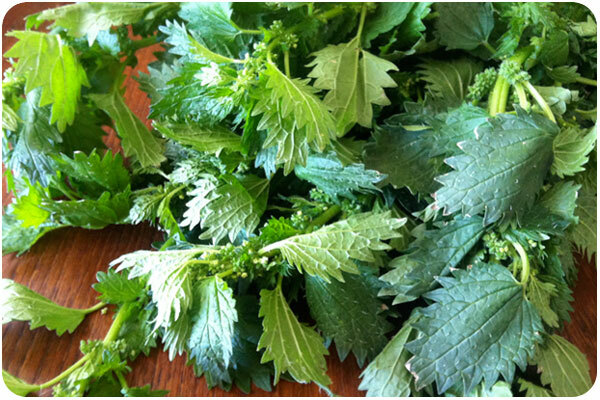 one thing you might notice, there is a faint fish-like smell to cooked nettles, but they don’t taste fishy. however, if you’re on the fence about this, make something that compliments it, adding smoked oysters or anchovies. 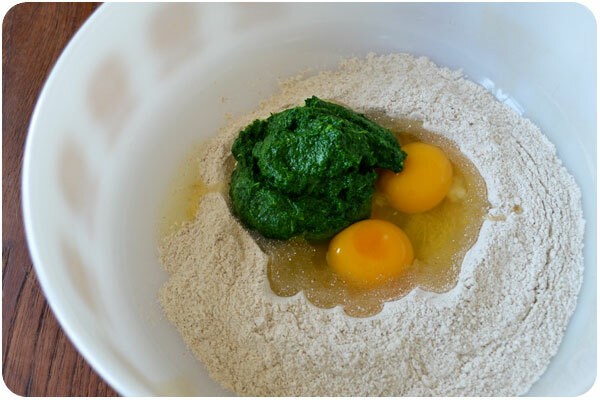 set up your pasta ingredients in a mixing bowl, spreading the flour to line the bottom of the bowl, cracking the eggs & pouring the oil in the middle with the nettles. use a fork as you would to scramble eggs, and scramble lightly, scooping up a bit of flour on each turn, mixing through, and continuing to incorporate flour until you have a loose crumbly dough. once the fork is no longer truly effective, use your hands to incorporate the dough fully and knead until smooth. let the dough rest an hour in the fridge and then roll it out and/or shape it as you like. when cooking, note that fresh pasta only take about 2 minutes to cook in boiling salted water. bring a pot of salted water to a rolling boil and add the nettle pasta. it will soften up rapidly, stir gently to cook through. after 1-2 minutes, strain out the pasta in a colander, and then place in a mixing bowl. shake up the lemon juice and olive oil in a dressing bottle or jar and pour over the pasta and toss to coat. incorporate the lemon zest and pepper with the feta cheese until mixed well. 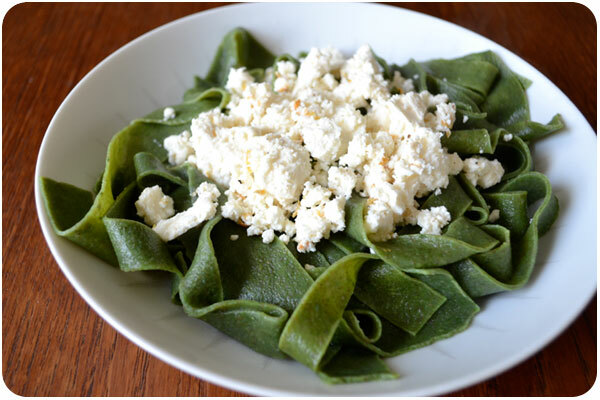 place servings of pasta in serving dishes and top with the lemon pepper feta.